Single Parents Review - ABC Pushes Hard For Unwanted Genre - Are You Screening? One of the problems with network sit-coms is that they often feel constructed around a target audience, rather than a good idea. In th case of Single Parents, this means that we’ve thrown together a setup that opens the door for a handful of precocious first graders to be fantastically cute while their parents rattle around in a world populated almost entirely by silly circumstance. That’s a little worse than it sounds, because once in a while throwing out a collection of buffoonish, but lovable, characters who seem plagued by wildly unrealistic events will turn into something like The Middle, which is why these particular dice keep getting rolled. When it goes wrong, a show opts for caricatures created by mashing types together, and is more worried about quick gags and one-liners than developing personality or comedy. Jokes, or points of plot development, don’t necessarily work, and we know that, but they get the next kid on screen to deliver a zinger. This is where Single Parents comes in. It’s a show that, despite a lot of potential, and in a way that is somewhat meta, has no sense of self. It’s a slave to the trappings of a genre that doesn’t quite exist, but seems to have fans, and it rarely goes long without some uncomfortable, disjointed offering in service to it that pulls the whole thing apart. It’s dangerously close to a show that has its characters watch cat videos during half its runtime, or more accurately, other sit-coms. For Single Parents, the worst hurdle on its road to ratings is that the pilot is really showing off two efforts, and it isn’t clear which one we’re going to get, or if it’s going to try to keep both balls in the air. In one, a group of single parents from a variety of walks of life have banded together in an attempt to help keep each other sane, and semi-distanced from the other parents at their children’s primary school. In the other, we’re just spit-balling odd parent jokes to see if anything lands. A small child sniffs longingly at his mother’s scarf, we kick up a running gag about a giant purse with a mermaid on it, or we have Brad Garrett set his twins to work detailing his car. One of them is like a group therapy version of Odd Mom Out, or American Housewife, minus the wealth status of the “others,” the other is Three’s Company with kids and less laughs. The show only delivers in the smallest chunks, and only when it is almost working against itself to establish the existence of the group. Four people, who are as unlikely a group as you could imagine, bond over their shared need for babysitters and as a certain support of their single-parent struggles. 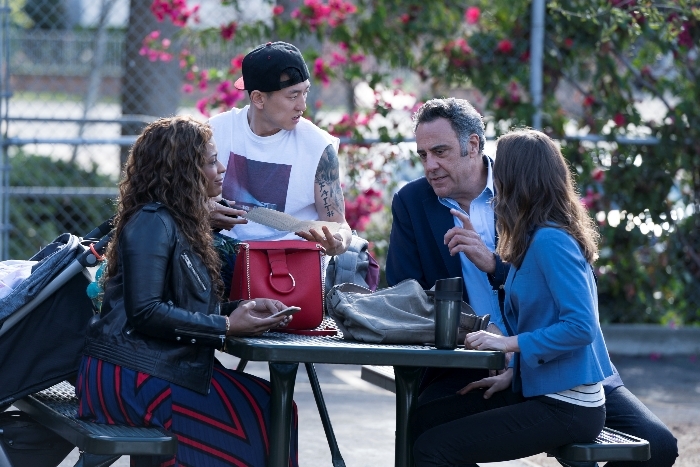 The mashing of worlds makes its own comedy, and getting to the heart of their dedication to each other is a road that Leighton Meester and Brad Garrett already deliver well, which is impressive. It only manages a rating as high as it does because the cast already outshines the material. The hope for the show comes by way of the fact that the pilot seems to actually set in motion the demise of everything its establishing. Over the last five or ten years, this has managed to become a trend, and sit-coms now frequently pull you in, hopefully, with some shtick that makes for a clever title, only to abandon it almost completely about a half-dozen episodes in. Assuming they last that long. Single Parents is a series that wants to lay the groundwork by focusing on a new single parent to the school, played by Taran Killam, and treat him as something of an avenue for the goofiest, silliest humor it can find to inject into things. His house is full of forts and bean bag chairs, his sexual drought is almost unimaginable, and he’s making necklaces out of Post-It notes. He’s also really, really cheery. Basically, he’s succumbed to single parenthood. Meanwhile, the kids all speak as though they’re not only fourteen, but have watched a lot more instructional parenting videos than you have. It makes for an easy period of spelling out the situation, because the group gets to be opposed to the school-centric “duties” they want to avoid, and another single parent (and his “doing-it-wrong-ness”), but it’s lazy and there’s very little to hope for in the comedy department. If the show can run screaming from its establishment as a hijinx-focused one-liner vehicle, give the kids more to do, and offer some depth to its parents, then there might actually be some laughs, and something worth watching.